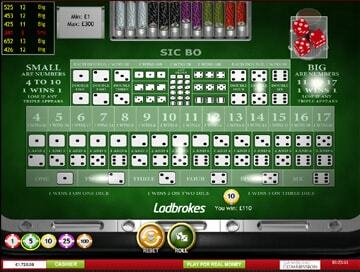 Sic Bo is a fast-paced, no-nonsense game that should appeal to fans of both craps and roulette, or anyone who just wants a change from their usual game. 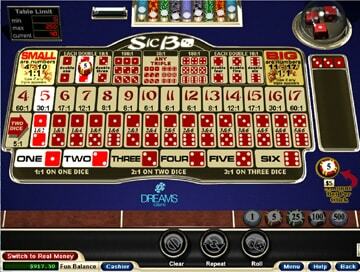 Sic Bo (pronounced See Bo) literally means "dice pair", but the game is actually played with three dice. It is also known as Tai Sai (Lucky dice) and Dai Siu (Big Small). A number of English games have been developed on the same lines as Sic Bo, namely Grand Hazard and Chuck-a-Luck. So if you're familiar with either of these, then you're on your way to understanding Sic Bo. 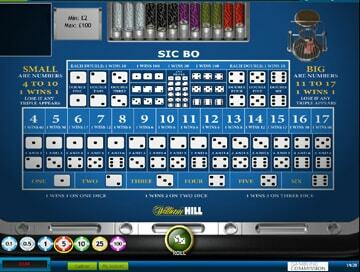 If you want to see a step-by-step video tutorial on how to play Sic Bo, check out this Youtube video, which I made for our sister site Live Dealer Sic Bo. Although the board may look complex, the rules of Sic Bo are very simple. Three dice are thrown in a small cage by the dealer, and punters bet on the results of the throw - e.g. the total of the three dice, any single number appearing, two specific numbers appearing, or a certain combination of numbers. Each bet has a different payout based on probability, and you can place as many bets as you like - similar to Roulette. We'll take you through the bets one by one to help you understand the game. The payouts on each of these bets differs, based on the probability of each score occurring. These are clearly displayed on the betting squares. For example, a total of 4 pays around 60 to 1 (ie win 60 units per unit staked) whereas a total of 10 or 11 pays out at 6 to 1 (win 6 for every 1 staked). The Total bet is used in a number of our Sic Bo strategies. You can bet on the total of the three dice being Small (ie 4 to 10) or Big (11 to 17). The payout on Big and Small is 1 to 1 i.e. it's an evens chance bet, like Red / Black in Roulette, making these bets the basis of our Lower risk Sic Bo strategy. An important rule to note is that Big and Small both lose if any triple appears. This explains why a total of 3 and 18 is not included in these bets. The 'triple rule' works in a similar way to the zero in Roulette i.e. it makes the 50/50 bets slightly less than evens chance, and keeping the house edge in the casino's favour. 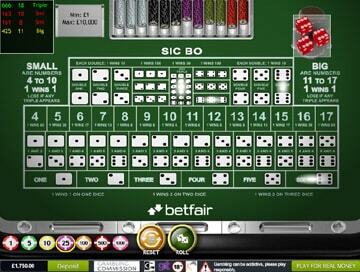 The Combination bet is a bet on any two specific numbers showing on the three dice. For example, you could bet on a Combination of 4 and 6, whcih would win if the three dice show 3, 4, 6. The payout on a Combination bet is 6 to 1 (ie you win 6 units for every 1 unit bet, giving a total return of 7 units), regardless of which combination you bet on. This differs from the Total bet (see below), which pays different amounts depending on the specific total. The Combination bet forms the basis for our Medium Risk Sic Bo strategy. The Single bet is a bet that a specific number will show on any of the three dice. The payout on a Single bet depends on how many occurences of the chosen number turn up on the three dice. If the number chosen turns up on one dice, you get paid 1 to 1 (1 unit won per unit staked). If it turns up on two dice, you get paid 2 to 1 and if it comes in on all three you get paid 12 to 1. This latter payout differs wildly from the Triple bet (see below), which pays 180 to 1 for a specific triple. But these different betting options are what make Sic Bo so fascinating! The Double bet is a bet that two of a specific number will show on the three dice. For example, a bet on Double 2 would win if the three dice show 2, 6, 2. You can bet on any double from 1 to 6 and the payout is 10 to 1 (ie you win 10 units for every 1 unit staked, giving a return of 11 units). Unlike the Triple bet (see below), there's no option to bet on any double - you have to bet on a specific double, though you can bet on as many doubles as you like, in combination with any number of other bets. The Triple bet is a bet that all three dice will show a specific number. You can bet on any specific triple from 1 to 6 and also bet that any triple (ie non-specific) will occur. The payout on any triple is 30 to 1 (ie you win 30 units for every 1 unit staked), but the payout on a specific triple is a whopping 180 to 1, making it the biggest payout on the board, and a far larger payout than the measly 35 to 1 on a single number in Roulette! It's a fantastic return if it comes up, but the odds against it happening are 216 to 1. Definitely a bet for the Sic Bo high roller!